Art Fag or Bust! 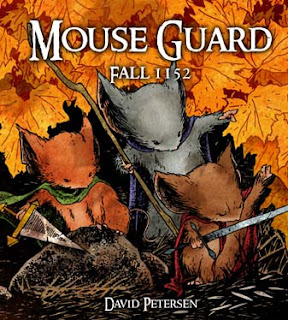 : Mouse Guard! For a while, my boyfriend has been asking me to make him some felties of the characters from the Mouse Guard series of comics. They had been on my radar for a while, but with Valentines day looming I decided to get on with making them. I started by drawing up some templates based on the characters, using mainly trial and error to get the sizes in proportion. The first template mice had massive heads, but this was easly rectified. First I made the ears, by glueing two contrasting pieces of tear drop shaped felt together and squashing underneath some heavy books until dry. I then squeezed them in the middle to create the 3D shape of the ears. I modelled these on my own rats, Basil and Loki, aiming to get the angled look of their ears. Next I sewed black seed beads on as eyes and started to oversew around the edges of the head, trapping the ears inside. Once this was completed and stuffed with toy filling, I started to make the bodies. These were based on the Zombie Felties I have made before, so I simply drew around the body of the zombie to create the mouse template. I adapted the arms slightly, as the lopsided zombie arms didn't look right for the mice. I sewed and stuffed the body in the same way as the head, adding a string of embroidery thread in the same colour as the inner ear pieces for the tail. I then sewed the head and body together. Lastly I made up a cloak shape with long thin strips at either side. These were then knotted around the mouse's neck to hide the join. And here is the full set!